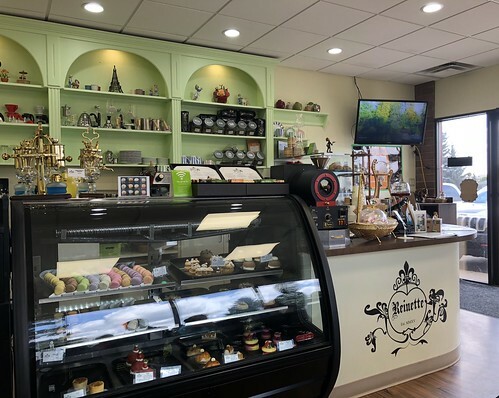 One of the best things about the current proliferation of bakeries in Edmonton is that many areas of the city that were once without a place in the neighbourhood to pick up a sweet treat or two have now gained that asset. Reinette Cafe is one such example. Nestled in a strip mall in Mill Woods, it’s not a place easily stumbled upon. It’s also quite small, with only a handful of tables and counter seats, so reservations are recommended if you’re hoping for a table to enjoy dessert (during our visit all but one table was spoken for). I had called ahead specifically for the afternoon tea set, which is priced at just $20 for two. The set includes your choice of seven treats from a defined menu, as well as two drinks. Although you don’t have to pre-order, we did so to guarantee the availability of our desired desserts (particularly helpful if one in your party, as was our case, is allergic to nuts, as several of the options contain nuts). Service was efficient, as the staff began assembling our tea tray right after we walked in for our reservation last Sunday afternoon. All we had to do was select a beverage (coffee or tea), which was delivered almost immediately after we ordered. A family-run business, it was clear the owners put some thought into the small details – our teapots, for example, were kept warm on special glass tealight stands, while the takeaway boxes were almost as intricate as the pastries themselves. We found the afternoon tea to be a great way to sample a variety of their desserts. My favourite was the lemon meringue tart – the buttery crust was topped with a beautifully balanced curd. Grandma Male enjoyed the richness and the flavour of the almond cream in the Paris Brest, and we all adored the duck-shaped madelines. 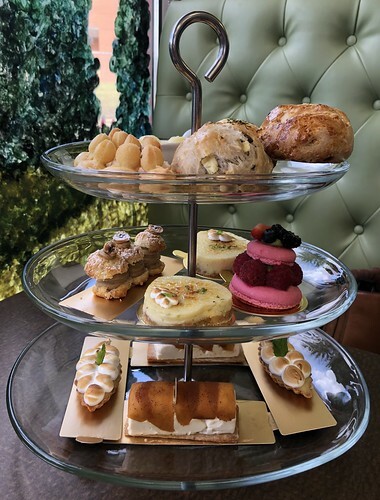 That said, given that they were the mini versions of said pastries, the tea is not as filling as other afternoon tea services available in the city (such as Hotel Macdonald or the Rutherford House’s Vintage Fork). Reinette Cafe does offer other savoury options including quiche and sandwiches, but they are not included in the tea set. Still, it was a great way to spend a part of the afternoon in a neighbourhood gem. 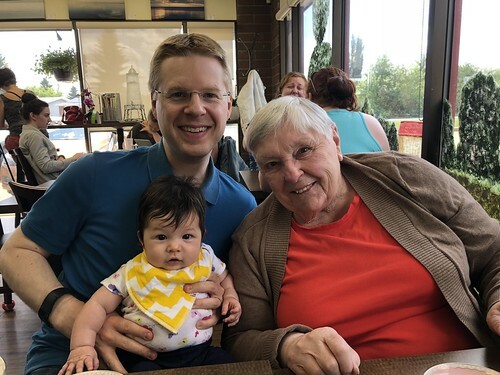 We’ll certainly be back again – I have my eye on another lemon meringue tart!